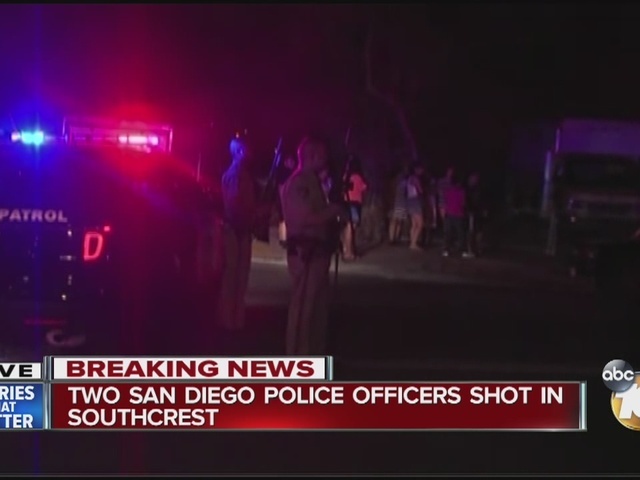 SAN DIEGO -- One San Diego police gang unit officer was killed and a second was hospitalized following a shooting late Thursday night during a traffic stop. San Diego police identified the deceased officer as Jonathan DeGuzman, a 16-year veteran of the force. DeGuzman, 43, was married and has two children, police said. The injured officer was identified as 9-year veteran Wade Irwin. Police said the 32-year-old Irwin is married and has one child. SDPD Chief Shelley Zimmerman said both officers were wearing body cameras. Police have confirmed a second suspect is holed up in a home in the Shelltown area. According to police, as of 11 a.m., the suspect remains inside a home. The events that led up to the shooting just before 11 p.m. were not immediately detailed. Zimmerman said that shortly after the two announced they were making a stop, they requested "emergency cover" from other officers. Responding officers found both men with gunshot wounds to their upper bodies. Early Friday morning, police confirmed that one of the officers had died from his injuries. The second officer was rushed to UC San Diego Medical Center, where he underwent emergency surgery and is expected to survive. He was recovering with his wife by his side Friday morning. A suspect, a Hispanic man who was also wounded by gunfire, was taken into custody and was hospitalized, Zimmerman said. It was not immediately clear if the suspected shooter acted alone. Officers continued to search the area for a possible second suspect. "The investigation is ongoing right now as to exactly what happened," Zimmerman told reporters at an early morning briefing. "We don't have enough information at this point." Neither officer's name was immediately released. Zimmerman described both of them as "heroic." The deceased officer was a husband and a father of two, Zimmerman said. He is the 33rd SDPD officer killed in the line of duty since 1913. He's also the third killed by gunfire since 2010.